Note: only users with access to the System Settings can customize the visibility of data in the mobile app. Go to System Settings > Free fields for events. In the overview with the free fields you can see which of the fields are visible to users and which are not. Fields marked with a green dot are visible. Fields marked with a red dot are not visible. To edit the visibility, select one of the free fields and check or uncheck the box Visible in itinerary. The visibility of this field applies to all the users that view their itinerary in the mobile app. 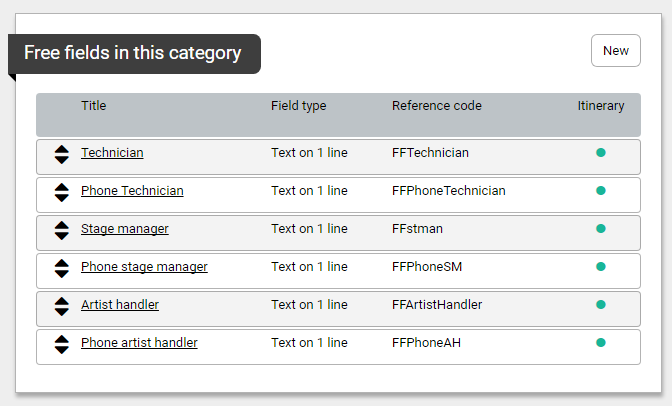 When you want to customize the visibility of data fields for specific users, go to Access panel and switch the checkboxes on or off for the relevant users.